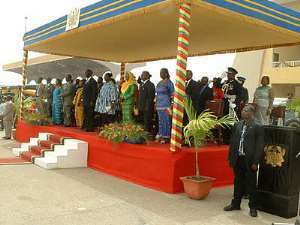 Live TV Broadcast: GTV courtesy of AkasanomaTV Accra, Jan. 7, GNA - Thousands of people on Friday converged at the Independence Square in Accra, which has been turned into an open air Parliament to witness the inauguration of President John Agyekum Kufuor, for a second term in office. The ceremony has been delayed over the election of a Speaker of Parliament. The huge crowd from all walks of life had arrived early in the morning for the occasion supposed to have began at 1000 hours. However, the inauguration has been delayed because of an impasse in parliament over the election of the Speaker. The Presidential Oath is administered by the Chief Justice before Parliament. Members of Parliament on Friday voted for the election of a Speaker following a stalemate between the Majority and the Minority over a single candidate. The Clerk of Parliament, Mr Kenneth Enos Kofi Tachie, who was in the Chair, called on the 230 MPs to begin voting after the Majority and Minority Leaders nominated different candidates. Mr Felix Owusu-Adjapong, Majority Leader, nominated Mr Ebenezer Sekyi-Hughes, Member of the Council of State, as the Speaker, while Mr Alban Bagbin, Minority Leader, nominated the Speaker of the Third Parliament of the Fourth Republic, Mr Peter Ala Adjetey. Several heads of state have arrived for the ceremony. The day is not a public holiday but employers are encouraged to allow workers to attend the ceremony.